On Tuesday, May 9th 2017, the SEEBURGER Client Day Italy took place at San Gaudenzio Castle, an amazing Castle of XIV century, immersed in the greenery, in Cervesina, a small village in the south of Pavia. Participants from more than 30 companies followed our invitation and did enjoy a day of networking and intensive exchange on how to take benefit from the digital change. Andrea Carrero, Vice President Consulting at SEEBURGER, opened the meeting with an introduction about the various integration challenges that have to be solved to successfully implement a digital business strategy. She outlined how this can be achieved with a modern and comprehensive integration suite. Then Francesco Bonello, Business Development Manager at SEEBURGER in Italy explained in more depth the benefits of an API Management solution to make use of cloud services without the need of major changes to corporate IT infrastructure or to actively offer own (API based) services to e.g. customers. the fist presentation explained how the SEEBURGER BIS 6 solution “On premise” has been selected to address the multiple integration requests from international trading partners in the complex automotive sector. The second presentation demonstrated how to benefit from SEEBURGER B2B Cloud Services. It was especially explained how to make use of SEEBURGER´s mapping repository to ensure fast partner onboarding, how the SEEBURGER cloud operation is regularly reviewed based on KPI reports and how as a result the business relations with numerous business partners could be improved. 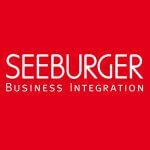 Finally, a long-term SEEBURGER client since 1999 gave insight in the quite complex scenarios of a large retailer and how they are using the SEEBURGER BIS 6 platform for all kind of integration scenarios: B2B (Business-to-Business), API/EAI (Enterprise-Application-Integration) and MFT (Managed-File-Transfer). This interesting day ended with fun driving activities at Tazio Nuvolari Circuit, a few steps away from San Gaudenzio Castle. We thank all the attendees for their contribution to make this day a special one. We hope to see you (and many others) again at our next events.